In “America’s Pacific Century,” Clinton announced that the Obama administration was “working with China to end unfair discrimination against U.S. and other foreign companies or against their innovative technologies, remove preferences for domestic firms, and end measures that disadvantage or appropriate foreign intellectual property.”  Which is exactly what the TPP sets out to do, except—and this is a significant point—without China. US defense secretary Ashton Carter says the Trans-Pacific Partnership is as important to him as another aircraft carrier. What’s more, “the China Development Bank and Export-Import Bank of China now provide more loans to the region than the (U.S.-dominated) World Bank and Asia Development Bank combined.”  And China “has picked off American allies like Britain, Germany and South Korea to join…the Asian Infrastructure Investment Bank, a project started by China in part to keep its own state-owned firms busy building roads, dams and power plants around Asia. China is at the same time setting up other trade pacts around the region so it can use its cash and enormous market leverage to strike deals more advantageous to its interests.”  Needless to say, the deals China strikes, the roads, dams and power plants it builds, and the trade it carries out, represent lost opportunities for U.S. banks, corporations and investors. China’s growing economic clout has raised concerns on Wall Street and in Washington of “being left on the outside, looking in.” Fearful that U.S. firms and investors “risked being shunted aside in Asia,” Washington initiated the Trans-Pacific Partnership  as a means of defending the interests of U.S. finance and business in Asia. One of the ways the TPP defends and promotes U.S. profits is by re-orienting the economies of the pact’s other partners toward the United States and away from China. “Ichiro Fujisaki, a former Japanese ambassador to the United States, described the Trans-Pacific Partnership as ‘economic glue to cement ties with like-minded countries,’ including emerging economies such as Vietnam that are only partly integrated into the global economic order shaped by the United States.”  The TPP isn’t as much about free trade as it is about restricting trade and investment within a US-dominated bloc. During talks, U.S. negotiators “aiming to bolster American exporters” stipulated “that countries joining its new Pacific trade zone cut back on imports from China.” U.S. negotiators demanded that “Vietnam, a major garments exporter, reduce its reliance on textiles made in China… to get preferential market access to the U.S.” Washington’s goal was “to create new markets in Vietnam for the U.S. textile industry.” Since the “U.S. and Mexico are especially large textile producers, Vietnam would simply have to shift its sourcing of yarns and fabrics from China to the U.S. and Mexico.”  This exemplifies the entire aim of the U.S.-initiated TPP: to disrupt China’s growing trade relations with its neighbors in order to bolster U.S. profits. In addition, foreign competitors are restricted by government rules, required to share their technology in joint ventures with state companies, and are passed over for lucrative government contracts in favor of state enterprises. China’s reliance on state-directed development has provoked ire on Wall Street and in Washington. Chinese “state capitalism” restricts profit-making opportunities within China for U.S. firms and investors. At a public forum in Davos, Switzerland, during the World Economic Forum, then U.S. Treasury Secretary Timothy Geithner complained that “China does present a really unique challenge to the global trading system, because the structure of its economy, even though it has more of a market economy now, is overwhelmingly dominated by the state.”  U.S. President Barack Obama, referring to Washington’s Asian rival, complained that “It’s not fair when foreign manufacturers have a leg upon ours only because they’re heavily subsidized.”  The point of China’s state-directed development is to raise many more hundreds of millions of Chinese from poverty, as the Chinese Communist Party has already done, even if it means irking U.S. banks, investors and corporations and their political handmaidens in Washington. The preceding paragraphs point to a significant reality of U.S. foreign policy: U.S. State Department initiatives are “prodded by corporate chiefs” and aim to open up the world to U.S. trade and investment–and keep it open. 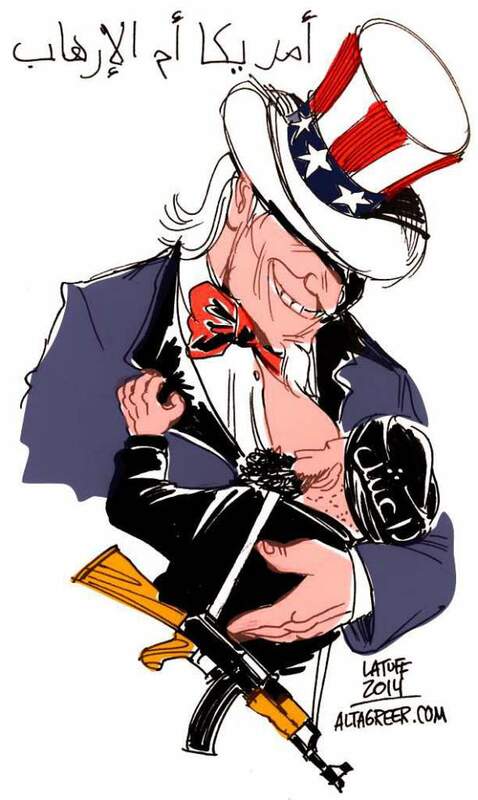 Trade and investment agreements, and the Pentagon, are both instruments of the U.S. corporate and financial world, deployed by Washington’s political elite to secure the interests of the United States’ most “substantial” citizens. 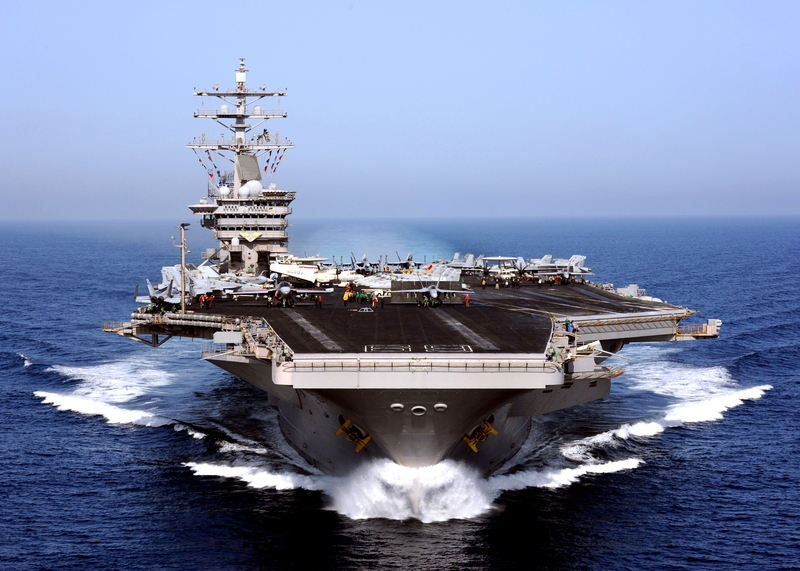 Hence, U.S. secretary of defense Ashton Carter can draw an equivalence between the TPP and an aircraft carrier. To the U.S. capitalist ruling class, China, with its immense market, represents a potential cornucopia of profits, all the greater if the Chinese Communist Party can be persuaded to abandon its state-directed development model, which severely restricts the latitude of U.S. investors, banks and corporations to manoeuvre within the Chinese economy. The Chinese model has proved worthy of lifting hundreds of millions out of poverty, not surprisingly, since its aim is internal development, not the aggrandizement of super-wealthy foreigners ensconced on Wall Street. By contrast, the development model favored by the corporate-based ruling class of the United States predictably favors private enterprise and free trade (within US-dominated blocs)—a model that has proved worthy of creating fabulous wealth for a parasitic elite at the apex of U.S. society, but abject poverty at the other extreme for people in the developing world. Finally, another reality should be acknowledged. Both Libya and Syria have followed development models that are very much similar to China’s, and have equally irked US corporate and political leaders. Equally, U.S. corporate goals of defending U.S. profit-making opportunities in Asia animated the activities which led to the TPP as an instrument of disrupting Chinese trading relations and pressuring Beijing to change its economic regime of internal development to one favoring Wall Street. U.S. military intervention against a resource nationalist government in Libya, the deployment of Islamist proxies against an economically nationalist government in Syria (in other words, the mobilization of religion for profane ends), and an exclusionary trade and investment bloc aimed at harming and pressuring China over its policy of state-directed development, have one thing in common: they are prodded by a parasitic elite at the apex of US society rooted in Wall Street and are intended to serve its interests by clearing away impediments to its further accumulation of capital on the world stage. 1. Laurence H. Shoup, Wall Street’s Think Tank: The Council on foreign Relations and the Empire of Neoliberal Geopolitics, 1976-2014, Monthly Review Press, 2015. 2. Hilary Clinton, “America’s Pacific Century”, Foreign Policy, November, 2011. 3. Ben Stein, “In class warfare, guess which class is winning,” The New York Times, November 26, 2006. 4. Jane Perlez, “U.S. 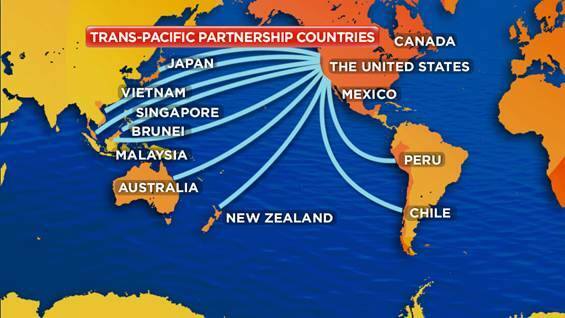 allies see Trans-Pacific Partnership as a check on China,” The New York Times, October 6, 2015. 5. Perlez, October 6, 2015. 6. 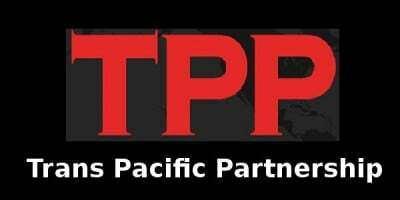 Kevin Granville, “The Trans-Pacific Partnership Trade Accord explained,” The New York Times, October 5, 2015. 7. Perlez, October 6, 2015. 8. Brian Spegele and Thomas Catan, “China suggests shift on U.S.-led trade pact”, The Wall Street Journal, May 31, 2013. 9. Helene Cooper, “U.S. defense secretary supports trade deal with Asia,” The New York times, April 6, 2015. 10. Jane Perlez, “Clinton makes effort to rechannel the rivalry with China”, The New York Times, July 7, 2012. 11. Perlez, “October 6, 2015. 12. David E. Sanger and Edward Wong, “As Obama plays China card on trade, Chinese pursue their own deals,” The New York Times, May 12, 2015. 13. Perlez, July 7, 2012. 14. Jonathan Soble, “Failure of Obama’s Trans-Pacific trade deal could hurt U.S. influence in Asia,” The New York Times, June 16, 2015. 15. Tom Wright and Mark Magnier, “Fabric of a trade deal: U.S. asks Vietnam to cut out Chinese textiles,” The Wall Street Journal, June 24, 2015. 16. Bob Davis, “U.S. blocks China efforts to promote Asia trade pact,” The Wall Street Journal, November 2, 2014. 17. Granville, October 5, 2015. 18. Perlez, “October 6, 2015. 19. Spegele and Catan, May 31, 2013. 20. John Bussey, “Tackling the many dangers of China’s state capitalism”, The Wall Street Journal, September 27, 2012. 21. Bussey, September 27, 2012. 22. Barack Obama, State of the Union Address, 2012. 23. Aaron Black, “U.S. raps ‘damaging’ China policies”, The Wall Street Journal, January 28, 2012. 24. Michael Wines, “Behind a military chill: A more forceful China”, The New York Times, June 8, 2010. 25. John Bussey, “U.S. attacks China Inc.”, The Wall Street Journal, February 3, 2012. 26. Joseph E. Stiglitz, “On the wrong side of globalization,” The New York Times, March 15, 2014. 27. Bussey, February 3, 2012. 28. Steven Mufson, “Conflict in Libya: U.S. oil companies sit on sidelines as Gaddafi maintains hold”, The Washington Post, June 10, 2011. 29. Mufson, June 10, 2011. 30. Clifford Kraus, “The Scramble for Access to Libya’s Oil Wealth Begins,” The New York Times, August 22, 2011.